Over the past several posts I’ve been blogging about incorporating a small business and have detailed the benefits of doing so followed by the general steps. Not surprisingly, as the CEO of Outskirts Press, I believe using a professional online service to help you do something conveniently and easily is better than absorbing the learning curve of trying to figure out how to do it yourself. It’s easier to go to a site and click “ADD TO CART” than it is trying to figure out how to register an ISBN, register a Copyright, apply for a Library of Congress Number, calculate the spine width of a book cover, resample images to 300 dpi, incorporate bleeds into a cover design, format an interior in InDesign, and….. Well, you get the idea. Sure, a writer could do all that herself, I suppose. Why on earth would she want to? Does she want to be a publisher, or does she want to be a published author? 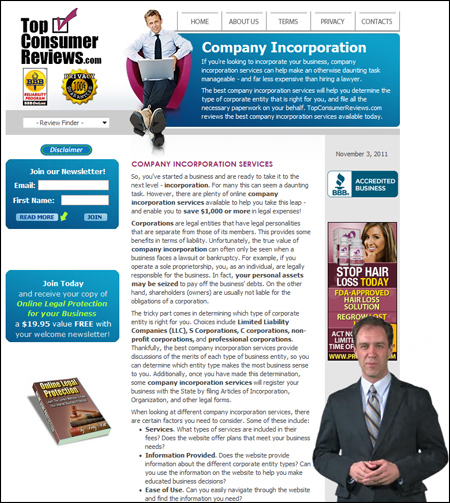 Compare Legal Forms also lists Incorporate, BizFilings, CorpNet, and Rocket Lawyer, while Top Consumer Reviews also lists The Company Corporation, My Corporation, My Law Daddy, and Corporate Creations. If I were giving legal advice (which of course, I’m not, since I’m not a lawyer), I might recommend looking into all those alternatives, but for the sake of brevity, we’ll just compare the two options that are represented on both sites. 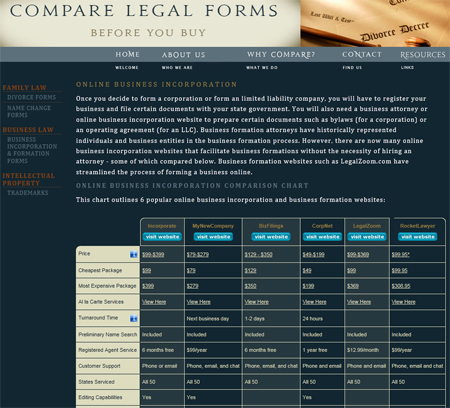 Compare Legal Forms doesn’t review the services, but rather lists their features. 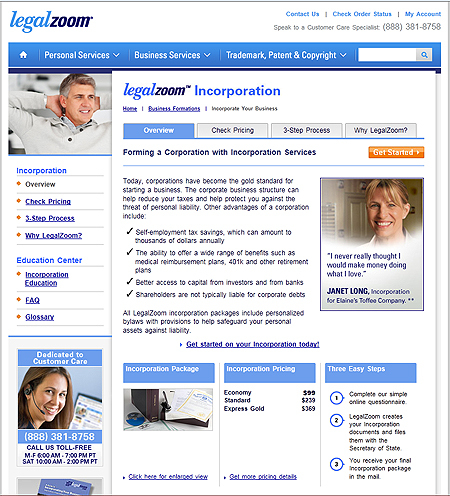 Top Consumer Reviews offers a review and a rating for each service it lists, and in their case, they consider Legal Zoom to be superior to My New Company. I also happened to ask a CPA his opinion and he also recommended Legal Zoom, at least for me — your specific needs may vary. But that just goes to show, when possible, it’s always nice to hear or read what other people have to say, too. For instance, we make our authors’ comments and testimonials readily available on the Internet (and we add 3 new ones each week) so anyone can review them by clicking here. Previous Previous post: Which online service should you use to incorporate a small business?